Test card called for releasing the Spaceship from WhiteKnightTwo and immediately entering a rapid descent. Upon release, the Spaceship experienced a downward pitch rate that caused a stall of the tails. The crew followed procedure, selecting the feather mode to revert to a benign condition. The crew then defeathered and had a nominal return to base. Great flying by the team and good demo of feather system. Earlier this week, SPACE.com’s Leonard David provided a little more information about that glide test. That discussion makes the flight sound a little more harrowing than the writeup in the official log, with one observer claiming that the vehicle “dropped like a rock and went straight down”. That, however, has not stopped a series of rumors, whispered during breaks at the ISPCS and on the Internet, that the incident was more serious than what the companies have reported. Those include rumors that they were testing a maneuver in order to perform a drop test at the Spaceport America terminal dedication event held Monday. 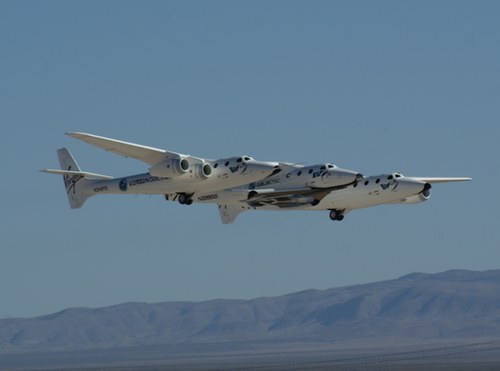 No such drop test took place, of course, but whatever happened did not prevent Virgin and Scaled from ferrying SpaceShipTwo from Mojave to the spaceport for the event. 6 comments to What happened on SpaceShipTwo’s last glide flight? According to the Scaled test log, it looks like the flight went according to plan. As an experimental vehicle undergoing envelope expansion test they intentionally take the vehicle beyond it’s limits so they know where the limits are. Now they have hard DATA on what angle and pitch rate will cause a tail stall. He’s right, there ARE other ways to destall the tail and Experimental Test Pilots practice them… using the feather WAS cleaver! When I read the MSNBC.com article the writer made it sound like they have a serious design flaw and etc. Um, just keep in mind, ever since the news media went corporate it has become focused on profits only and only interested in RATINGS to sell advertisements and while they have to keep to the truth (except Fox News apparently) they do try to make it sensational, dramatic, negative and inflammatory to get peoples attention and get them to watch their show, read their article, etc. So far… I trust this website cause it doesn’t seem to carry any advertising and Jeff Foust seems pretty on the level. I tend to think that trusting Wiki sites and forums are the only sources of “potential” truth out there anymore… at least they have LOTS of independent fact checkers across the globe to increase the odds of truth. In a world where TRUTH is written by the victor (or the 1% that is in control and/or wealthy) I trust the 99% or at the very least, if you can get a majority vote. Let’s face it, through fear mongering, intimidation and propaganda the 1% have managed to convince a significant portion of the American population to side with them. Oops, how did space get so political? Back to SpaceShip2… the other thing that crossed my mind is that maybe they were running at an odd CG (center of gravity) to test that out too. The Discovery Channel video on SS1 showed the “backflip” stall in a dramatic fashion but again, they did many successful stall tests and that one was where they had the CG really, REALLY far back to simulate the weight of the rocket motor so I doubt it was a surprise that it did what it did. And they had placed the CG that far back using water as ballast in a fiberglass tank they build to saddle up to the rocket motor casing… dumping that water would have moved the CG forward enough to allow recovery but Mike Melvill just happens to be an excellent pilot and was able to recover even with a rear CG. Another good test. I’d note that the comments from Virgin and TSC officials, including Ostrem’s description of the flight at ISPCS, indicate that this was not a deliberate test; rather, they entered the stall by accident by pitching down mote than planned. Fortunately, it appears to have turned out OK for then, since they were able to recover from the stall using the feather and land safely, and likely got some good data in the process. It’s a reminder that this is, after all, a test program, and during such test flights unanticipated events will happen. PS: Peter: I won’t respond to your media commentary other than to note that Leonard David (who writes for SPACE.com, not MSNBC) is a veteran journalist who has covered the space field for decades. He’s not the type who indulges in “sensational, dramatic, negative and inflammatory” writing, in my experience. Oops… I didn’t mean to insinuate that Leonard David per say indulges in “sensational, dramatic, negative and inflammatory” writing and if Leonard is reading this, please accept my apology! I was aiming more or less at the news outlets and publishers that cherry pick which articles to write and more importantly, which ones to feature or promote the most. Its just that when reading through his article I could see how people unaware of how test flights work might see it as a dramatic example of a serious design flaw. Adding a little commentary to explain away worry such as “It’s a reminder that this is, after all, a test program, and during such test flights unanticipated events will happen” would help the outsiders understand that unexpected things are to be expected in a test flight program. I hope I didn’t get too carried away in my previous comment. It’s just that this Personal Spaceflight revolution is very important to me and I think the future of the human race… I want to see it succeed. Succeed soon, succeed inexpensively and open up space to the rest of us. You seem a little too enthusiastic in just defending that this was just a regular old day in the ups and downs of aviation. Sure seems to me that Leonard got it right–exactly right like he does with all of his work and is some indication of why he was elected by his peers as the Space writer of the year last year. I have also noticed that Richard Branson’s public relations arm is rather active in putting a happy face, although not accurate one on everything that Richard does and especially on all of Virgin Galactic’s antics which is in truth trying to sell $200,000 tickets on this very same piece of hardware known as Spaceship 2. Unless I am wrong, this is actually science, engineering and aerodynamics and no SHOW BUSINESS–people lives are at stake. I have also noticed that the comments in response to Virgin’s news release in response was heavily weighted with what sure looked like Branson’s own people pretending to write gloriously positive spins on this story. Peter: Are you a real person or do you belong to Richard Branson’s PR department. It has now been 3 1/2 months since SS2 was last let loose. If this was a minor issue I would have expected testing to continue. Also I don’t understand why WhiteKnight2 (Eve) has not been out cruising to build up flight hours. Since the drop test in September there has only been the flights to New Mexico for the dog and pony show, and one day of flying to “cold soak” and test the landing gear.